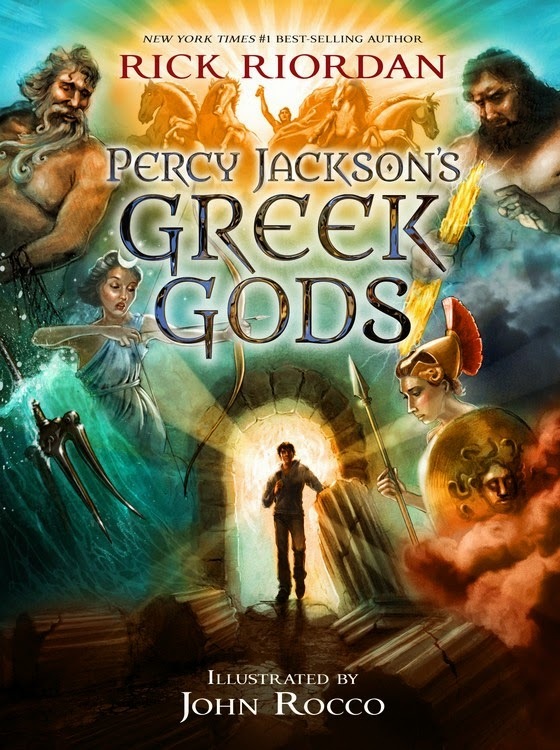 This week we began reading aloud Percy Jackson's Greek Gods with our 10-year-old. It is so much fun, I just have to share it -- even though we're barely a fraction into it. While I usually only share here books I've read in their entirety, I wanted to capture some of the laugh-out-loud moments we've been having. I also want to encourage you to keep reading aloud with your kids, even when they're reading proficiently on their own. That time together is pure gold -- treasure it and store up as much as you can. "I hope I'm getting extra credit for this," Percy Jackson starts. "A publisher in New York asked me to write down what I know about the Greek gods, and I was like, 'Can we do this anonymously? Because I don't need the Olympians mad at me again.'" While we haven't read the rest of the Percy Jackson novels together, my daughter knows plenty about them from her friends. She's curious about the Greek gods, but it's really Percy's voice that captured her attention. Percy starts from the very beginning of time, with Chaos ("a gloomy, soupy mist with all the matter in the cosmos just drifting around"), Gaea the Earth Mother, and Ouranos the sky. 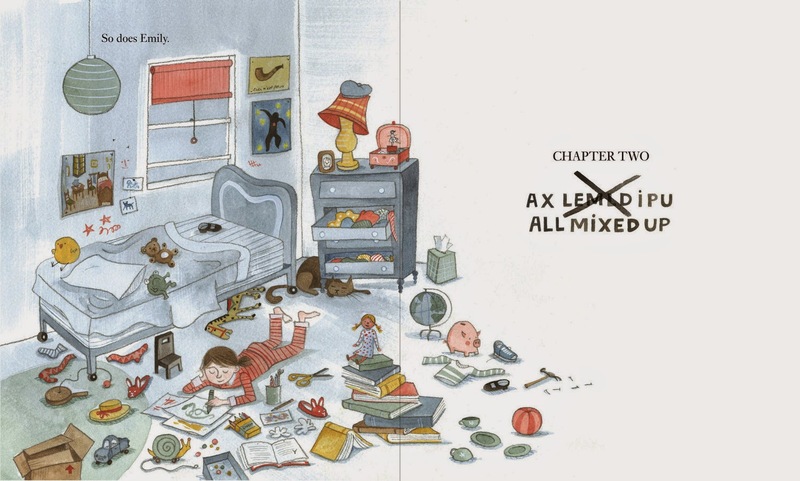 Riordan packs a huge amount of detail into his tales, and we are finding it hard to keep track of all the names. So far, we've watched Kronos overthrow his father Ouranos, with the help of his four brothers Koios, Iapetus, Krios and Hyperion. And now Kronos is terrified that his father's curse will come true, and he will be destroyed by his own children. But the main characters are familiar to me, so I can help keep us on track. "Without a word, (Ouranos) wrapped them in chains and tossed them into Tartarus like bags of recycling." "Why is Zeus always first? Seriously, every book about the Greek gods has to start with this guy. Are we doing reverse alphabetical order? I know he's the king of Olympus and all--but trust me, this dude's ego does not need to get any bigger. You know what? Forget him. We're going to talk about the gods in the order they were born, women first. Take a backseat Zeus. We're starting with Hestia." I just love the way Riordan infuses his retellings with plenty of modern attitudes. "Maybe you'll feel better about your own relatives, knowing that the first family in creation was also the first dysfunctional family." But he also doesn't skimp on the details, foreign names and intricate family trees. That's why this is working so terrifically as a read-aloud. 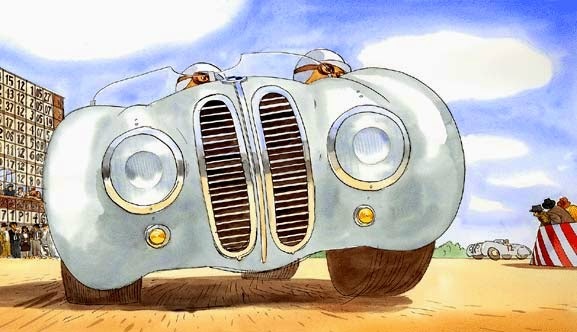 John Rocco's illustrations are magnificent. As Kirkus Reviews states, they "smoke and writhe on the page as if hit by lightning." Head over to John's blog to read more about his artwork and see sketches of some of the interior art as he is developing it. An index, list of illustrations and suggestions for further reading are included in the back matter. My one complaint at this point is I wish there was a family tree and/or list of all the characters with a pronunciation guide. In the meantime, I think I will print out either this basic family tree from Encyclopedia Mythica. The review copy was kindly sent by the publisher, Disney Hyperion Books. If you make a purchase using the Amazon links on this site, a small portion goes to Great Kid Books. Thank you for your support. Even as a child, I loved the way historical fiction whisked me away to live in another time and place. These novels helped me understand what it might have been like to live through difficult times in history. But they also gave me strength and courage to face my own difficulties. 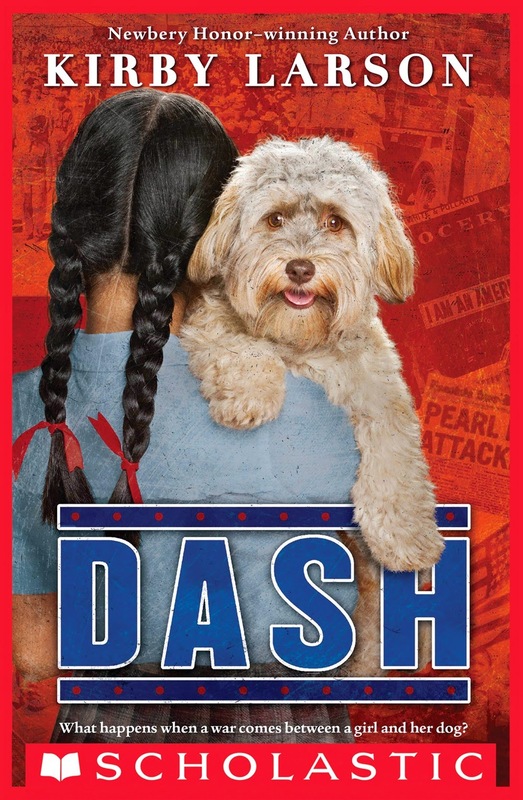 In Dash, by Kirby Larson, Mitsi Kashino and her family are forced to leave their home during World War II simply because they are Japanese American. "Loneliness wrapped around her like a snake. She never, ever dreamed that her friends would desert her like this. How was she going to make it through the rest of the year? The rest of her life?" Young readers will be able to empathize with Mitsi, especially with the way she finds comfort in art and in her dog. When her family receives the order to move to Camp Harmony and leave Dash behind, Mitsi is devastated. Larson builds the story carefully, first helping readers connect to Mitsi and then showing them how she felt torn from everything she knew. The story is infused with heart and feeling, but it never gets bogged down. I loved the period details, from the game "Hinky Pinky" or the slang Mitsi and her friends use ("I'm busted flat. Can't help."). "Larson makes this terrible event in American history personal with the story of one girl and her beloved pet...This emotionally satisfying and thought-provoking book will have readers pulling for Mitsi and Dash." For an in-depth review, head over to Librarian's Quest and her post: "Not Ever Again". I so agree with Margie when she writes, "Our hearts are bound to Mitsi as she struggles to understand, as she develops skills to adjust and survive and writes letters to Dash (Mrs. Bowker) and receives messages in return." I'm certainly looking forward to sharing this with students and seeing how they relate to Mitsi. If you liked this, you'll also certainly like Duke, also by Kirby Larson. Check out what our students had to say about Duke in last year's Mock Newbery discussions. The review copy was kindly sent by the publisher, Scholastic Books. If you make a purchase using the Amazon links on this site, a small portion goes to Great Kid Books. Thank you for your support. As a school librarian, I want to find many ways to engage young children in exploring the world around them. Sometimes that comes from sharing a picture book or novel, and other times it might be helping them explore online resources. Recently I have been very moved by historical fiction about the experience of Japanese Americans during World War II, as they were forced from their homes following Executive Order 9066. Today I would like to share some online resources to help children learn more about these experiences. 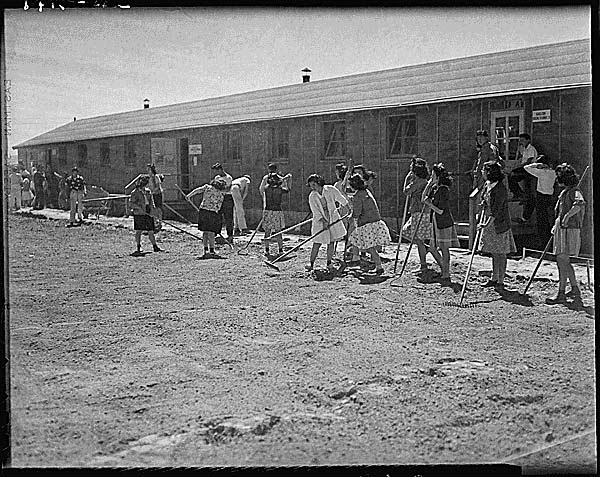 "a pioneering effort to build a permanent “living museum” online featuring the stories of those whose lives were forever changed by the signing of Executive Order 9066 by President Roosevelt on February 19, 1942, which instigated indignities and injustices for over 285,000 people of Japanese ancestry residing in the U.S. and abroad." This introductory video featuring George Takei sets the stage for learning about the way Japanese Americans were treated here in America during World War II and the mission of the Remembrance Project. A short video like this helps children start building visual images to use in their understanding of historical events. The Remembrance Project starts with a short introduction to Executive Order 9066, but students will be most interested in exploring pictures, memories and descriptions of the prison camps and people who lived through this ordeal. For example, I really wanted to learn about Minidoka Camp in Idaho, because Kirby Larson set part of her novel Dash in that camp. Tomorrow I will share more about this moving novel, but I want to start off by sharing these resources. I especially like how easy it is to browse through the Remembrance Project, discovering information, photographs and primary source materials. This site will bring home for children how this is living history for many families, whether grandparents or great-grandparents had to go through this terrible experience. For even more resource, check out the National Park Service website about the Japanese American Experience. This includes links to three National Park Service website as well as six other sites that children and families will find interesting. Although Mitsi Kashino and her family are swept up in the wave of anti-Japanese sentiment following the attack on Pearl Harbor, Mitsi never expects to lose her home--or her beloved dog, Dash. But, as World War II rages and people of Japanese descent are forced into incarceration camps, Mitsi is separated from Dash, her classmates, and life as she knows it. The camp is a crowded and unfamiliar place, whose dusty floors, seemingly endless lines, and barbed wire fences begin to unravel the strong Kashino family ties. With the help of a friendly neighbor back home, Mitsi remains connected to Dash in spite of the hard times, holding on to the hope that the war will end soon and life will return to normal. Though they've lost their home, will the Kashino family also lose their sense of family? And will Mitsi and Dash ever be reunited? It is crucial we find age-appropriate ways to share about the terrible persecution of Japanese Americans during World War II in the United States. And yet, how do you introduce this topic to children, especially kids in elementary school? 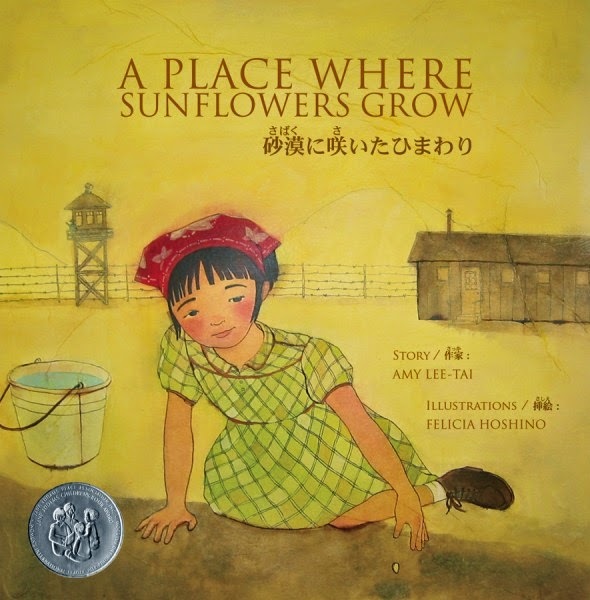 A Place Where Sunflowers Grow is a wonderful picture book by Amy Lee Tai, whose grandmother was sent to the Topaz internment camp during the war. Drawing upon her grandmother's story of internment at Topaz during World War II, Amy Lei-Tai finds a small piece of sunshine in young Mari’s story. Like thousands of other innocent American citizens, Mari and her family have been forced to leave their home simply because of their Japanese heritage. Mari loves art, but it's so difficult to find anything to draw in a place so hot and desolate. “Flowers don’t grow easily in the desert,” laments young Mari during her first week at Topaz. “It will take time, patience, and care,” her mother replies. 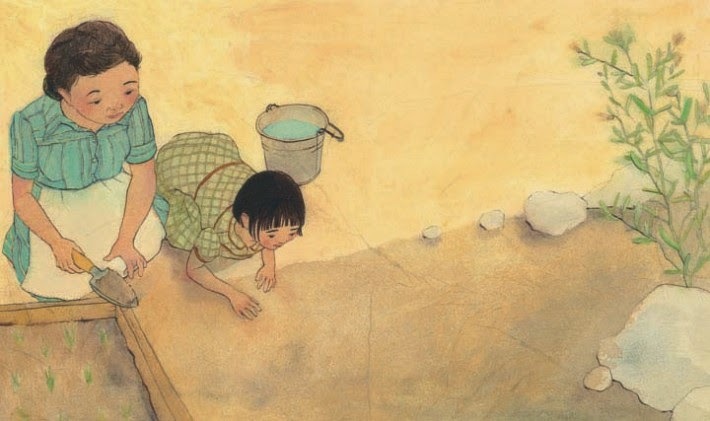 Eventually, with the encouragement of her family and her teacher Mrs. Hanamoto, Mari finds comfort in her weekly art class as she paints pictures that remind her of home. I was really struck by how Lee-Tai’s delicate story brings this difficult time to a young audience. The story is written in both English and Japanese, and the lovely audiobook is also produced with both languages narrated a page at a time. The review came from our local public library. If you make a purchase using the Amazon links on this site, a small portion goes to Great Kid Books. Thank you for your support. Are you getting nervous about the beginning of the school year? Will your child be able to make the transition to a new school, new teacher, new friends? There's nothing like the nervous excitement of the first day of school. Some kids are raring to go, while others are tentatively clinging to their parents. Whatever the case, try out these two new favorites to add some humor as you read about the first day of school. Starting school is certainly exciting, but it can also be nerve-wracking. One imaginative little kid knows it might be just like blasting off into outer space. There are strange routines, new crewmembers, and you might even get a bit homesick. Bold colors and a retro-style amp up the humor in this fun twist on getting used to a new school. 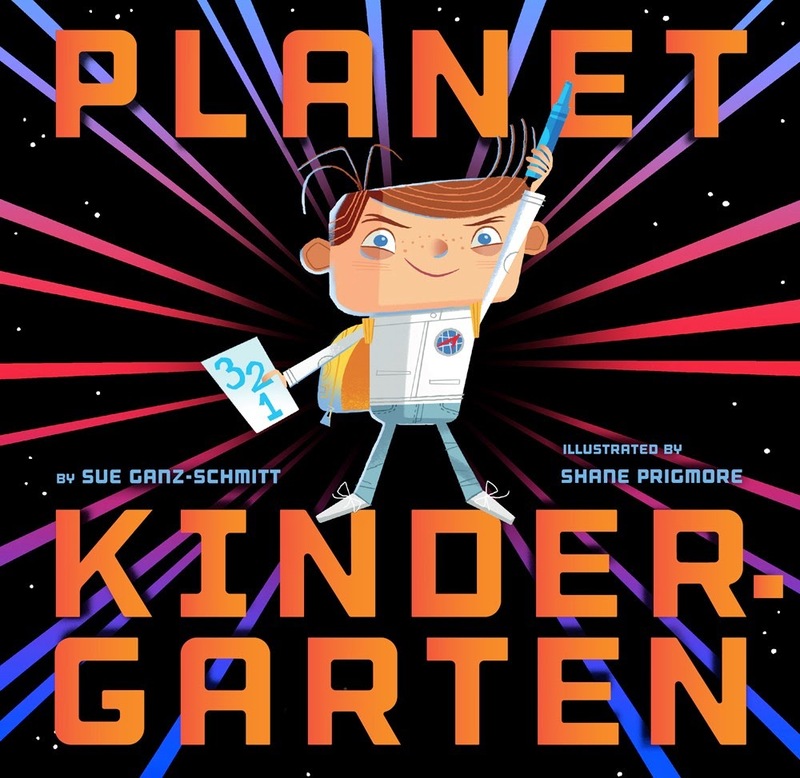 You can definitely tell that Shane Prigmore has an animator's background -- check out his blog to see some of the fun inspiration he used in developing the artwork for this. 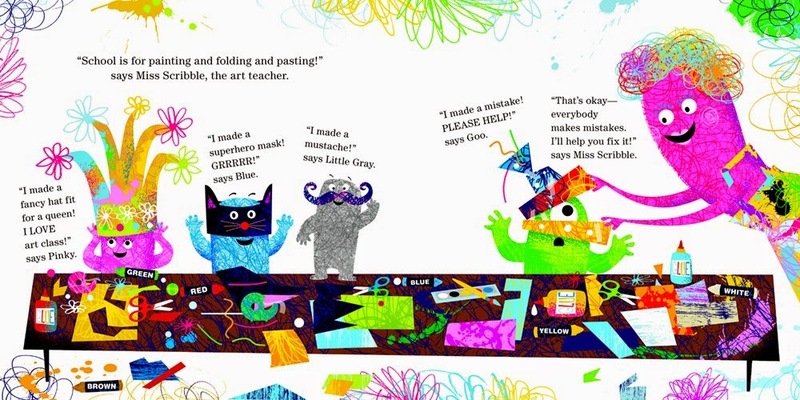 I just love the way Ganz-Schmitt captures the joyful chaos of kindergarten. Share this with any kindergarten teacher, and she/he will love the line, "Gravity works differently here. We have to try hard to stay in our seats. And our hands go up a lot." In a delightful turning of the tables, a five-year old boy can’t wait to start kindergarten and his mom is anxious about his going to a new school. “Will you be okay in the big kids’ school? You’re still so little,” she frets. “Mom, don’t worry. I’ll be fine, I am already five!” he declares as he dashes off to school. 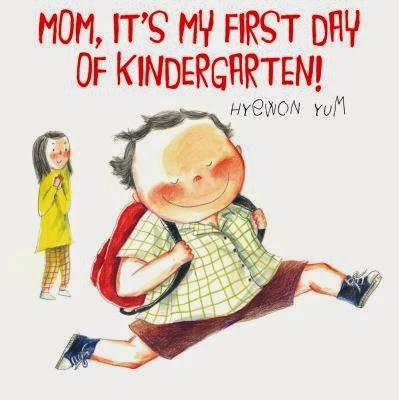 The boy is full of confidence -- I just love the way that Hyewon Yum shows this visually, with the kindergartner big and bold, and his mom small and blue. Until he peeks inside the classroom door ... and the roles reverse again. I hope your little ones come home declaring, "Kindergarten is awesome!!!" The review copies were kindly sent by the publisher, Chronicle Books and Macmillan. If you make a purchase using the Amazon links on this site, a small portion goes to Great Kid Books. Thank you for your support. Summer is ending and soon kids will head back to school. Some are excited for new adventures, but many will be sad to see summer over. Help your kids talk about the changes that are coming with two new books that take a silly and sweet look at the new school year. These are both perfect for little kids starting preschool or kindergarten. Lola is one cute little kitty, ready to pounce, play and explore. When she finds pink glasses, a stylish outfit and a backpack, she decides to join the rest of the kids on the school bus. "Hooray! Lola is going to school!" 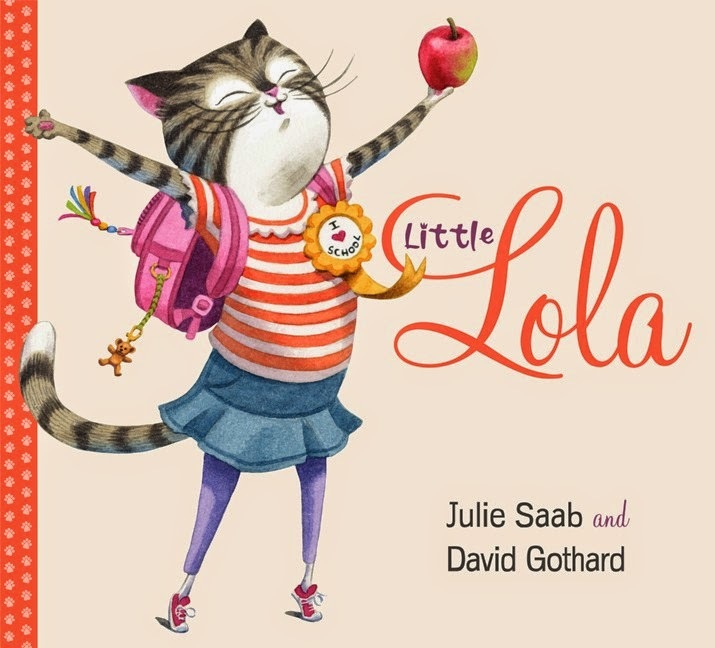 Lola has fun doing all sorts of activities at school -- writing, reading, painting, singing, and more. "Lola loved it all!" The story might be slight (dare I say fluffy like a kitty? ), but it will help bring smiles to any little kid who's anxious about what happens at school. Lola's positive attitude is sure to rub off on them. 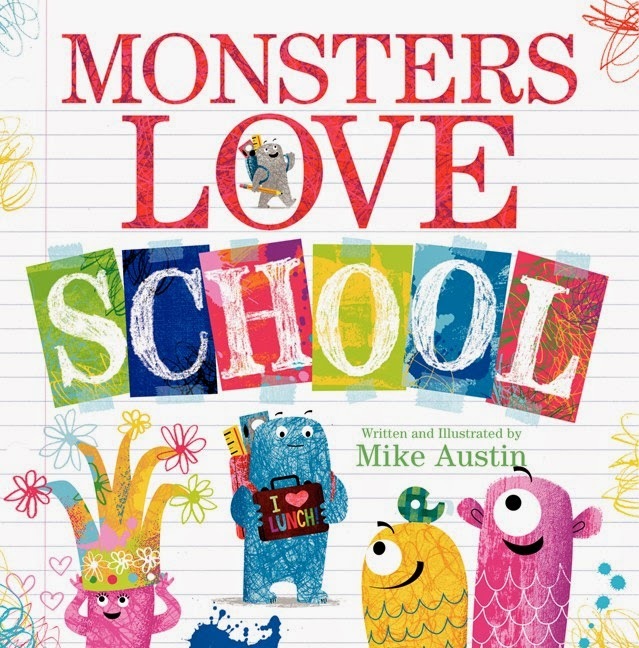 "Austin has masterfully folded some valuable information about the first day of school into his funny tale, but the monsters are the big draw. 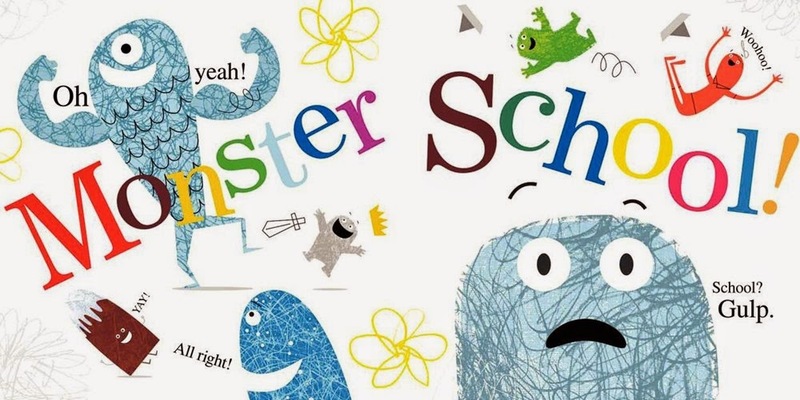 Not the least bit scary, their simple shapes and accessories and scrawled style will likely have kids reaching for their own 'monster pencils, monster crayons, monster ink and brushes.'" Looking for more Back to School book ideas? Check out this article in School Library Journal: Backpacks, Lunch Boxes, and Giggles Galore: Back-to-School Adventures, by Joy Fleishhacker. The review copies were kindly sent by the publisher, HarperCollins. If you make a purchase using the Amazon links on this site, a small portion goes to Great Kid Books. Thank you for your support. Are there ever times that you feel the world around you is getting just too mixed up? Whether it's countries at war or friends not speaking with one another, there are times that the world seems turned upside down. 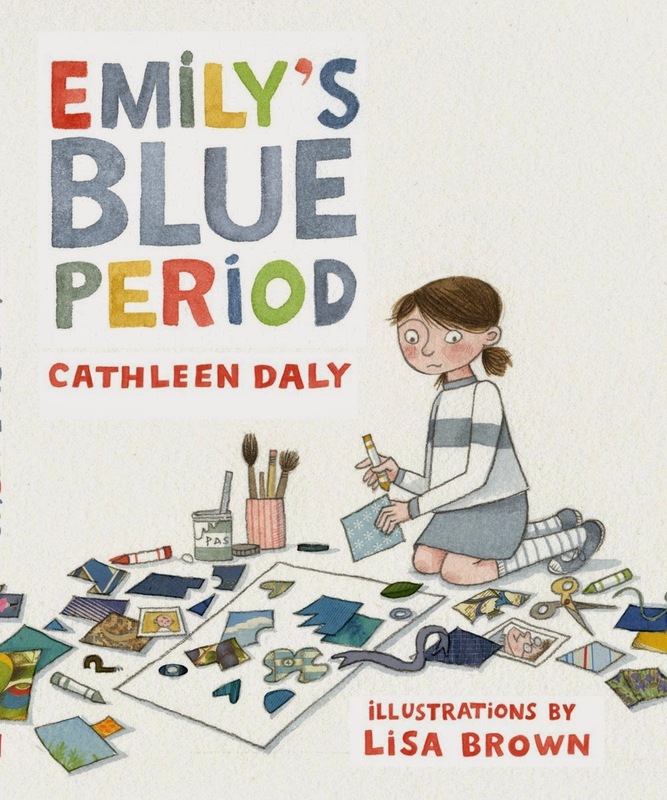 Emily's Blue Period, a favorite new picture book, captures one child's reaction to such a moment and how art helped her find her way through. Emily loves art and particularly the artwork of Pablo Picasso. She's fascinated by the way he used shapes to compose his paintings in unusual ways: "He liked to mix things up." Emily wants to create art using all sorts of things as well, but lately she's been feeling as if her life is just too jumbled. Emily's parents have recently separated and her "dad is no longer where he belongs. Suddenly, he lives in his own little cube." Emily uses her art to express her feelings, connecting to Picasso and his blue period. I love the way Emily wrestles with her emotions, recognizing she is sad and frustrated. When her teacher asks her to make a collage of her her home, she is flummoxed--she has two homes now. Which should she show? Cathleen Daly reveals Emily's journey, letting us quietly watch her rather than telling us everything she's thinking. 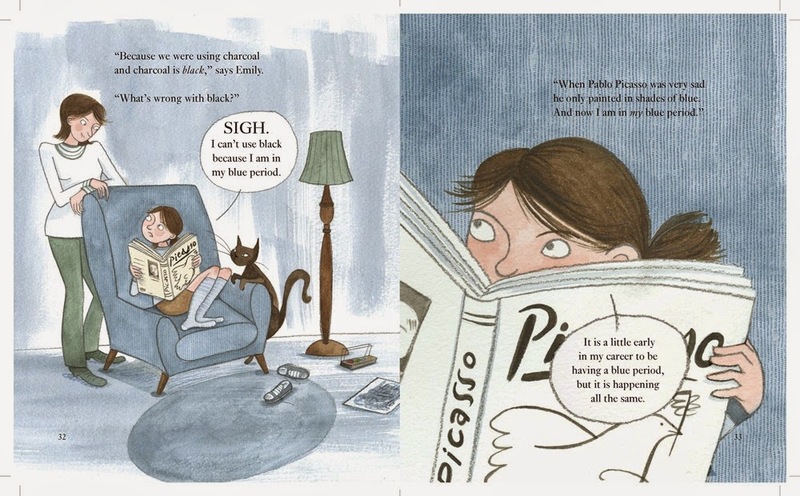 Lisa Brown's soothing illustrations help readers connect to Emily and visualize a sense of Picasso's blue period. Brown uses grey-blues throughout, creating a subdued tone that is never dark. As a child, "I enjoyed the company of a book as much as the company of most people, and reading as much as I did I developed a rich inner world that allowed me to be, for the most part, with or without a book, happy in my own company. This active, dense inner world also fueled a font creative endeavors." "I read somewhere that Ray Bradbury said that writers should read, read, read as much as possible – this feeds the imagination to the point of bursting, that it’s likely to come spilling out on the page this way. This was certainly was true for me a child. I spent hours hanging out in the local library reading and writing." "My main hope for the book is that it give solace and inspiration to young readers who may or may not be going through difficulties of their own." Yep, a kindred spirit indeed. Share this book with children you know who are contemplative, or who are wrestling with their own blue period. By the way, San Francisco Bay Area teachers and librarians -- both Daly and Brown live in our area. I especially love some of the material Brown shared in a recent interview over at Seven Impossible Things about her school visits. Definitely check it out! 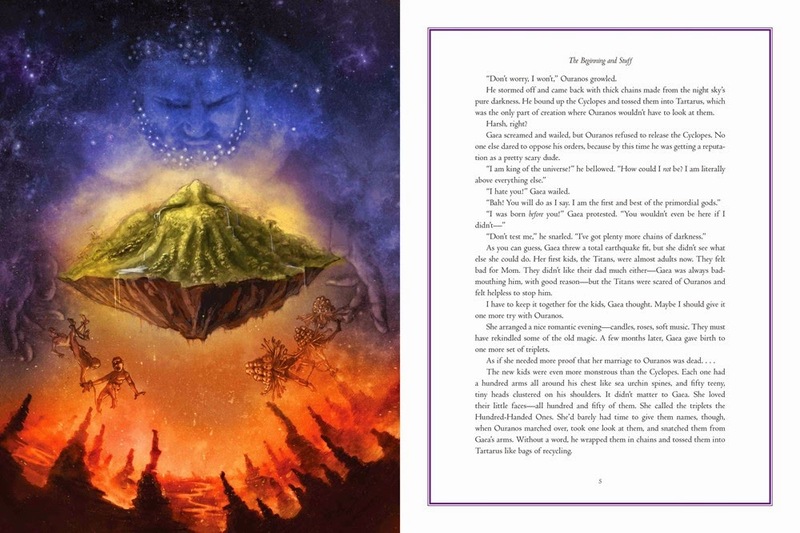 Images used by permission of Macmillan Children’s Publishing Group. The review copy was kindly sent by the publishers, Macmillan Books. If you make a purchase using the Amazon links on this site, a small portion goes to Great Kid Books. Thank you for your support. Like many of my students, I love getting lost in a story--so absorbed that I am transported to that time and place, that I live with the characters in my mind. I just finished reading to a new biography of the Tsar Nicholas II of Russia and his family, the last of the mighty Romanov monarchy, and I couldn't put it down. I highly recommend the audiobook and think many teens and their families will find it fascinating. narrated by Kimberly Farr, et al. Candace Fleming pulls the reader into the story of the fall of Imperial Russia by providing both an intimate look at the royal family and a careful understanding of the political and social context of their time. It's interesting to read a story when you know the ending, but I found myself on the edge of my seat at several points, wondering just how it would turn out. Tsar Nicholas II ruled over the immense Russian Empire, which stretched from the edge of Germany and the Baltic Sea all of the way across Europe and northern Asia to the Sea of Japan. He wed his beloved Princess Alix of Hesse in 1894, just weeks after he ascended to the throne. But the world around them began crumbling under the weight of tremendous social inequalities and poverty, exacerbated by Nicholas's own ineffective political leadership. Fleming helps readers understand this context by using a myriad of primary sources: diaries, letters, first-hand accounts of life in Russia at the turn of the century. 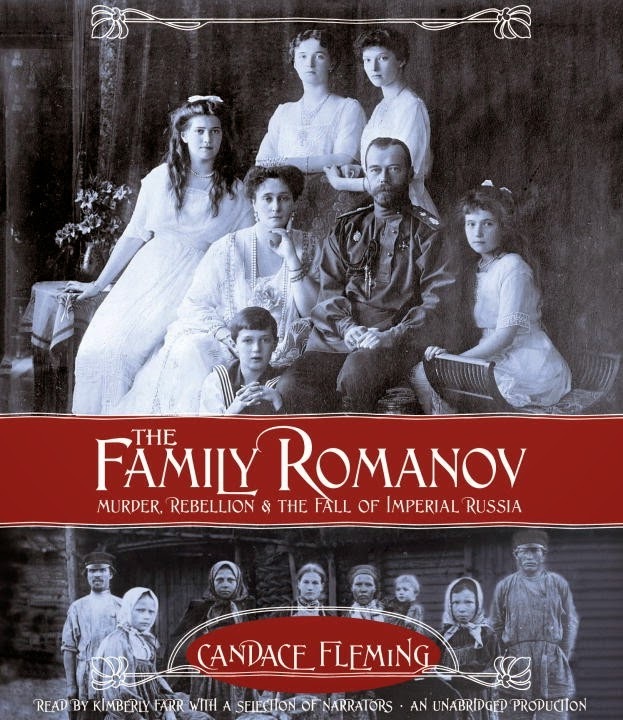 Fleming decided, according to an interview in Kirkus Reviews, to keep “any context as close to the story as possible.” These contemporary accounts help readers understand both the day to day lives of the Romanov family and also the discontent and anger that ran through Russia at the time. Kimberly Farr imbues the audiobook with heart and soul, helping listeners connect with the family members and envision their world. She subtly changes her voice so listeners know when she's reading an actual letter or diary, bringing the myriad characters to life. I also really liked the way the producers used different narrators, often with Russian accents, to read diary excerpts from other individuals. Winner of AudioFile Earphones Award for July 2014. Show teens this video from History.com to get them interested in the mystery surrounding the Romanov's deaths. It's likely they know Anastasia from the animated film, but I'm guessing they don't realize its historical basis. You might also have interested kids listen to Fleming talk on TeachingBooks.net about her inspiration for writing the book, which stems back to when she was a young teen and discovered a book on her mother's bookshelf. She then reads aloud a chapter from the book, to give readers a sense of her voice. The review copy comes from our home library, purchased from the terrific Vroman's Bookstore in Pasadena. If you make a purchase using the Amazon links on this site, a small portion goes to Great Kid Books. Thank you for your support. Reading Online: How will it affect developing readers? 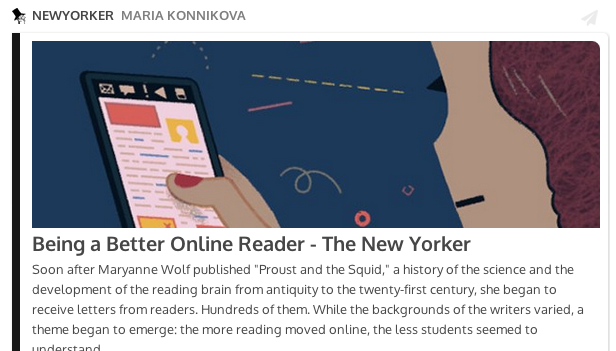 I read with interest a recent New Yorker article, Being a Better Online Reader by Maria Konnikova, and I would love to explore my thoughts on this article. We all are reading much more online than we did ten years ago, but how is this affecting the way young children are developing as readers? How is this affecting the way teachers and librarians help students learn to read, discover a love of reading, and develop their critical thinking skills? I feel very strongly that if we are going to start assessing students online, then we need to provide specific experiences and instruction for reading online. Explicit instruction is crucial -- it is unfair to assume that our children are "digital natives" and learn through osmosis how to read online. If we make those assumptions, we will simply reinforce the digital divide that is created by unequal opportunities and access. On screen, people tended to browse and scan, to look for keywords, and to read in a less linear, more selective fashion. On the page, they tended to concentrate more on following the text. Skimming, Liu concluded, had become the new reading: the more we read online, the more likely we were to move quickly, without stopping to ponder any one thought. I would argue that this skimming is an essential skill for coping with the huge amount of information we have to sift through online. We need to teach our students how we skim effectively. But we also need to talk with them about strategies for when we discover a nugget -- how we need to consciously slow down to digest the information. Julie Coiro, who studies digital reading comprehension in elementary- and middle-school students at the University of Rhode Island, has found that good reading in print doesn’t necessarily translate to good reading on-screen. The students do not only differ in their abilities and preferences; they also need different sorts of training to excel at each medium. The online world, she argues, may require students to exercise much greater self-control than a physical book. I have noticed this with my own daughter, whose high school is now one-to-one iPad. She likes reading her English texts online because she can annotate them well, but she prefers to read in print if she is just absorbing and enjoying a book. Schools must specifically teach students in 4th grade and above how to apply their reading skills to digital reading. Starting in elementary school, they need to practice researching online and teachers need to talk about how this might be different from reading a print book. It is essential that our schools invest in technologies, so that teachers and students can learn these skills. But I would also argue that it's essential for schools to invest in librarians who understand this intersection between reading, information and digital experiences. Adults often ask me if kids will continue reading print books. I believe the answer is absolutely yes. First of all, there's access and quantity issues. Children in first through third grade need to read 10-20 short books every week. They want to browse through physical copies. Schools, libraries and families need access to inexpensive paperbacks. Even highly digital affluent families are reluctant to continue purchasing ebooks at this rate. I would also argue that there is something more tangible, more comforting, more reassuring for young kids holding print books. Konnikova quotes Maryann Wolf, author of Proust and the Squid, as saying “Physical, tangible books give children a lot of time." Young children need that time. Families need that time. It is interesting that I read this article online, following a link suggested by KQED's Mindshift blog. But I returned to it several times, reading it in different chunks, rereading it, skimming it again. This type of repeated reading might be what our students need to get comfortable doing, taking the time to dive into ideas and ponder them. As you watch your children and your students, are you noticing that they are reading digitally more than they were a few years ago? Is the way they are reading changing? The digital world certainly brings more opportunities within easy reach for many students, but how are we preparing them to take advantage of those opportunities? Wow-oh-wow. 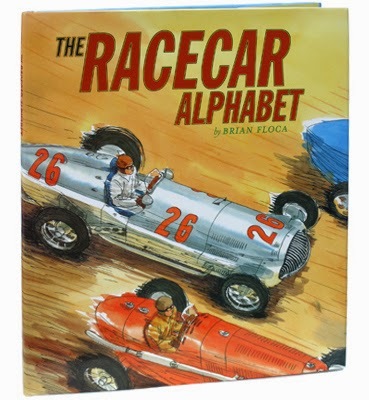 The Racecar Alphabet, by Brian Floca, is absolutely brilliant -- perfect for young speed racers (and their parents, too!). Kids will be drawn in by his dynamic illustrations, but they'll come back again and again for the layers of information they discover with each reading. the buzz and bark of engines. But there's more! Look closely at the endpapers as you open the book, and you'll notice that the cars are arranged in chronological order. 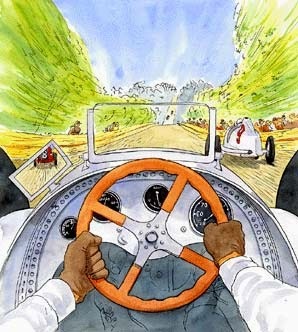 Read the text again and you'll notice that each letter of the alphabet progresses through automobile history, from the 1906 Renault (emblazoned with a number 1, because it's on the A page) to a 1934 Mercedes-Benz (number 9, "instruments / indicating speed") to a 2001 Ferrari F1 (number 26, "zipping, zigzagging, with zeal and zing"). When I came across an image of one of those cars a few years ago, a switch went off in my head. I had never been much of a racing fan, but suddenly I appreciated how extraordinarily beautiful these cars could be. Here was sculpture, nothing less. It just happened to be sculpture you could drive through scenic European settings at extraordinary speeds. I truly believe that picture books are an essential way we can introduce our children to art. I'm guessing many parents will never take their children to a museum. But here, they can get a feel for the importance of perspective, colors, lines, and composition. And make tons of zooming, churning, speeding noises at the same time! The review copy came from our home library. If you make a purchase using the Amazon links on this site, a small portion goes to Great Kid Books. Thank you for your support.